The Blossom Shop, a real live local professional florist shop only 4 miles from Eydon, will deliver fresh beautiful flowers in Eydon and the surrounding areas, including Culworth. As a local independent florist, we stock the freshest flowers, ordered direct from the best growers and flower auctions, aiming to properly serve the local community. 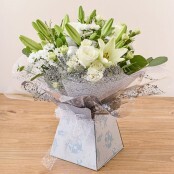 If you want to make a great impression, order a stunning bouquet for same day delivery in Eydon, satisfaction guaranteed. If you want to talk to the florist who will arrange your flowers to discuss what you'd like, then call The Blossom Shop. We accept Mastercard/Visa over the telephone as well as online. Don't forget we also offer free home consultations for people arranging Weddings and Funerals; please do not hesitate to call or e-mail for an appointment to benefit from this personal service. Don't forget, we also supply flowers for weddings and funerals and offer free home consultations for both. Why not call or e-mail us and ask for an appointment?